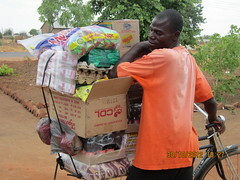 Today, as we were packing to catch tonight’s flight back to Lusaka, the above invitation arrived by email. 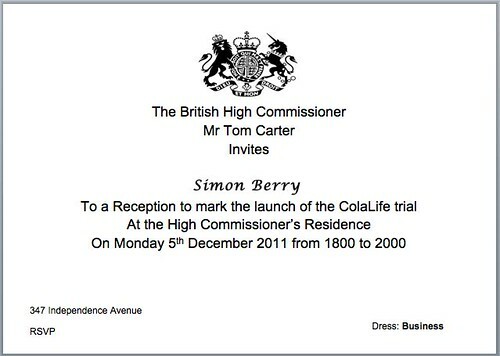 The British High Commissioner, Mr Tom Carter, is hosting a reception to mark the launch of the funding agreement for the ColaLife trial in Zambia on Monday (5/12/11). So, the secret is out: we can now confirm that our final funder – and majority funder – for the ColaLife Operational Trial Zambia is: DfID Zambia. We are grateful to them all. All but Honda are able to be represented. We are still in negotiations with a fifth funder who will support work to follow-up interest in ColaLife from other countries. This work will be additional and very complementary to the trial. More on this later. The launch reception is an opportunity for us to say thank you and re-engage with all the people in Zambia who have contributed to the trial design or helped us in other ways. We hope that some of these will be willing to serve on the trial steering committee. Before the reception, all the implementation partners will come together for a final pre-trial workshop, to focus in particular on the detail of the Gantt Chart and the dependencies. This will allow us to get off to a flying start and launch the trial in January. If someone had said to me, 3 years ago when I set up the ColaLife Facebook Group, that next week we’d be at the High Commissioner’s Residence in Lusaka celebrating the launch of the funding agreement for ColaLife Trial, I wouldn’t have believed them. Dreams can come true! Well done Simon, a well deserved and significant milestone for Colalife, and recognition for all the hard work and energy you’ve given to the project. Your passion has clearly been infectious and its so good to see so many people now sharing your vision. I look forward to the next chapter! Fantastic news Simon! Very inspirational. Good old DfID! Well done Simon. That’s really good news. I’ll be thinking of you at the BHC on Monday night. Dreams can come true! 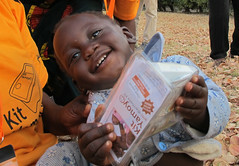 : https://t.co/9MdpLtUd Great news from @colalife announcing main funder for Zambia trial. RT @davidwilcox: Dreams can come true for @colalife. Congrats @51m0n & Jane on DfID + other funding https://t.co/CazUidOa <wow great Simon!